We sent writers to four adult sleep-away camps. Whether you want to channel The Parent Trap or start the path to self-discovery, adventure awaits—and the s’mores are going fast. I grip the hatchet and mirror Eric as he walks me through the mechanics of a successful throw. Point the blade at the target. Pull it back near (but not too near) my ear. Then let it fly … or tumble to a clumsy thud, several feet shy of the target. Eric hands me another. Flinging deadly implements is the third activity of my day, coming on the heels of the morning’s Barbecue 101 class, where I evaluated dry-rub recipes and practiced smoker-stoking skills on generous cuts of pork. Before that, I spent an hour paddling a kayak around Little Hills Lake, gliding through quiet coves filled with lily pads and the silver flashes of fish. It’s a pretty standard lineup at Camp Halcyon, a summer sleep-away camp in woodsy Wautoma, Wisconsin, 87 miles north of Madison. The term “halcyon” denotes the golden days of a season past, when all was well and idyllic. This aptly named camp delivers just that. Imagine the iconic camp that you might have attended (or, like me, only dreamed of attending) as a child: a communal mess hall, post-dinner scavenger hunts, activity-filled days and gender-segregated sleeping bunks. Except Camp Halcyon isn’t for kids. It joins the growing ranks of adult-focused summer camps, some of them general and others centered on outer space, music, foreign language or yoga. No matter the focus, all hold similar promise: They’re an excuse to shed the rigors and responsibilities of the grind, detox from “adulting,” and spend a few days enjoying the lost pleasures of childhood. 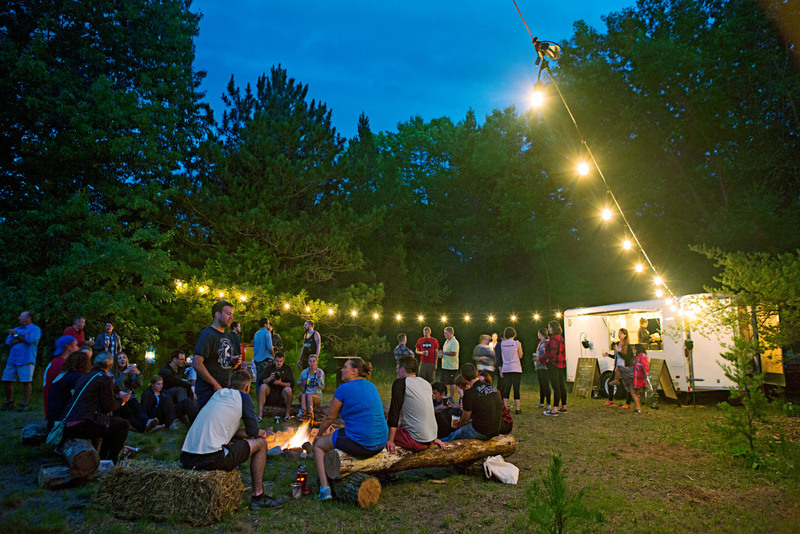 Some, like Halcyon, add lodging options for couples, while others make campers come alone, forcing them to forge new friendships and learn a thing or two about themselves. The fun might include scotch-and-cigar sampling in the woods, doing yoga on the beach, painting in the arts-and-crafts cabin, or lazing away the hours with a good book in an Adirondack chair. When the dinner bell rings (yes, someone actually rings a 3-foot-tall bell outside the main lodge), 120 campers form a buffet line, then join one another at long tables. Dinners can include burgers, steak, scallops or barbecued ribs. After dinner, campers trickle into a clearing a half-mile out from the camp. Alongside a well-stocked s’mores bar, bartenders hand out old-fashioneds, made the Wisconsin way with brandy and seltzer. Campers kick back on hay bales and log benches around a large fire. Others giggle through campfire games or wander off with flashlights. As the flames dwindle from bonfire to popping flicker and campers move toward their bunks, I point out the bright band of the Milky Way to new friends who have never seen it. A marshmallow bursts into flame, turns to a charred blob and gets gobbled up anyway. Because at summer camp, no one’s grading on performance or appearance. We’re here to play. This year, Camp Halcyon will host four-day camps ($459) in July, August and October. Book at camphalcyon.com. In an equal-opportunity America, it’s hard to describe the appeal of Becoming an Outdoors-Woman without sounding terribly 1950s. After all, girls can do anything guys can do, right? Why should we need our own camps? For the same reason our daughters still need Girl Scouts: Because sisterhood is real. It’s safe. It’s empowering. And it’s fun. How I came Held across the country, BOW programs offer lessons in shooting, fishing, campfire cooking and more to women like me—people who aren’t adrenaline-seekers but crave a fresh challenge (and fresh air). Newbies often bring a sister, mom or friend. Some “BOW junkies,” as one veteran puts it, forge a family bond that calls them back into the wild each year. How I left It was extraordinarily satisfying. New skills. Good people. Tired muscles. An invigorating boost in confidence. I may become a BOW junkie yet. Becoming an Outdoors-Woman’s programs are run independently, often through states’ departments of natural resources. A typical weekend trip might cost $250. Explore online to learn about options near you. Arrive alone. (No spouse or friends.) Surrender your phone. Ride to an undisclosed place. This is no Hollywood thriller, but the premise for a weekend of intense reflection. You just have to say Yes. FRIDAY 3 p.m. / The Unknown Random address in Chicago. The handful of strangers around me (mostly women, ages 30 to 60) seem normal enough. One last text message. Gulp. 3:35 p.m. / Trust Pile into an SUV with our hosts, Life of Yes founder Saya Hillman and her husband, Pete Aiello. 4:30 p.m. / Ride Saya says getting fired inspired her to start her business. Others share their stories. I reach for my phone, then remember Saya and Pete took it. 5:30-ish p.m. / Settle In The car pulls into a scenic retreat center on Lake Michigan. We find our simple dorm rooms, eat tilapia and rice, then play silly games before settling in for real talk about life goals, purpose and passion. SATURDAY Morning / Inspiration Pancakes. Then we draw pictures to illustrate the sorts of quotes one sees plastered over sunrises on Facebook: “Life shrinks or expands in proportion to one’s courage.” I could be cynical—but it’s actually nice. Afternoon / Say Yes Saya shares 15 steps to living a Life of Yes, such as “Embrace your suckage” (as in, take a dance class after learning you have no rhythm). A silent group walk precedes solo free time. I journal, wade into the frigid lake and wander into town. Evening / Share By flickering candlelight, we disclose personal challenges—coping with grief, breakups, weight gain. Hard to believe we were strangers yesterday. SUNDAY Dawn / Awake With pink wisps overhead, a few of us reach the lake before the sun pops over the horizon. Later, each camper identifies an area in their life needing an emphatic “yes.” In pairs, we chart practical steps for reaching our goals. Afternoon / Remember We share excerpts from our journals (with some tears), pose for a photo and pen reflective letters to ourselves. Then we pack up. 5 p.m. / Home Chicago again. Hugs. Some of us begin to leave when Pete calls, “You might want these,” holding out our phones. Mine feels heavier than it did two days ago. Or maybe I feel lighter. 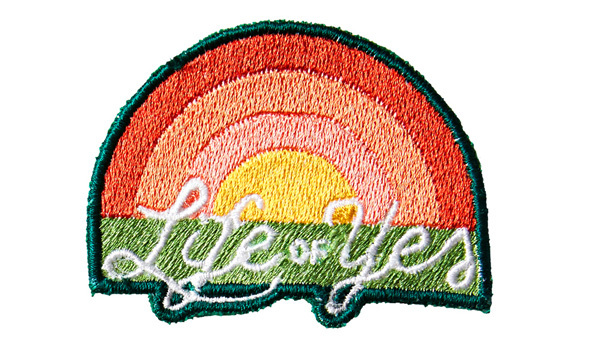 With Chicago-based Life of Yes, no two experiences are alike. Find a meet-up, workshop or weekend trip ($585) at macncheeseproductions.com. Bunk Camp Brosius offers families a range of choices. Go with the classic (and affordable) setup of bunk beds and a shared bath, or splurge on a deluxe cottage with a kitchenette and screened porch. Play Along with swimming areas and tennis and basketball courts, campers have access to canoes, kayaks, paddleboards, pedal boats and other outdoor gear (plus indoor activities on rainy days). For water sports like tubing, you can bring your own boat (fishing tackle, too!) and dock for free. Chow Dine in a classic summer camp mess hall. On Tuesdays, youngsters go on a “kiddie cookout” and hayride so Mom and Dad can enjoy a special meal of prime rib or haddock with wine. Hallelujah. In addition to week-long family camps (from $480 per adult), Camp Brosius hosts themed camps focused on art and wellness or for college students. Learn more at campbrosius.iu.edu.